With cities all across America considering mandates concerning recycling we are already years ahead thanks to starting RecycleLink in 2008. Because of the success of our forward thinking single stream process we are now able to offer a GREAT deal when it comes to recycling the easiest way there is with NO SORTING REQUIRED. 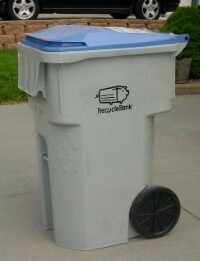 Not to mention that we are the only RecycleBank Rewards equipped provider in Lincoln. Even better, you can now you receive community points every week without even having to set it out each week! When the community recycles everyone wins!